While ceramic and glass cookware have been popular for a while, old-fashioned cast iron cookware is coming back into style. These heavy pots and pans can last for up to a hundred years if well taken care of. This makes their sometime hefty price tag well worth the investment. However, with the popularity of toxic non-stick cookware, many people are intimidated by the small amount of maintenance cast iron cookware requires. This is where things get a little tricky. Cast iron pots should never be soaked in water or left in the sink. These habits will make your pan rust. When it’s well oiled, cookware should be easy to clean by running it under a bit of hot water. For stubborn caked-on food, boil water in your pan and use coarse salt and a stiff brush to scrub any residue away (1). Once clean, towel dry the cookware and dry it on the stove over low heat. Afterwards, apply a light coat of oil in the inside of your skillet using a clean cloth or paper towel. Store in a dry, cool place, protecting your cupboard with a cloth or paper towel. The best way to maintain your pan and give it a natural non-stick sheen is by regularly seasoning your pan (2). While Butter and vegetable shortening are commonly used, coconut oil works even better! Coconut oil, has a high smoke point of 177°C (350°F). Other healthy high smoke point oils include avocado and almond oil (3). 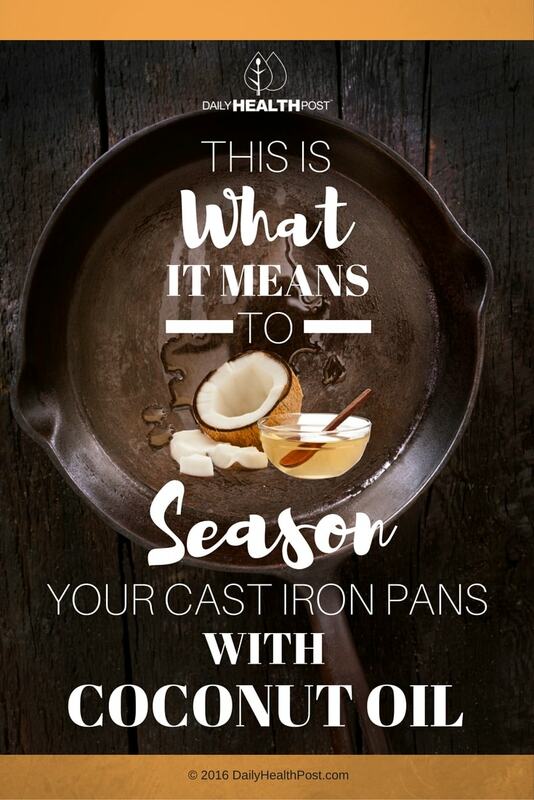 The extra coating of coconut oil helps prevent iron from leeching in to your food. Coconut oil is also full of antibacterial compounds that kill more bad bacteria than regular soap (4). Wash the cookware with hot, soapy water and a stiff brush. This is only time you should be using soap on cast iron since you’ll be seasoning it again. Rinse and dry completely your cookware. 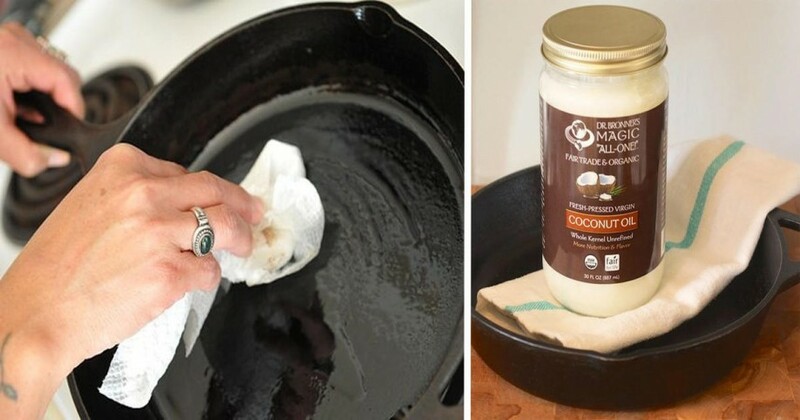 Apply a very thin, even coating of coconut oil inside and outside of your cookware. Don’t apply too much, as it will end up sticky. Line the bottom rack of the oven with aluminum foil to catch any drips of oil. Place cookware upside down on the top rack of the oven to season properly. Bake the cookware for at least one hour. Once baked, let the cookware cool in the oven.